The most obvious place to start (once you’ve begged your board to allow you as many scouts as possible), is ensuring your scouts are fully equipped for the task at hand. The scouts you hire can be split into four main categories; chief, next opposition, domestic, and foreign. Chief: if you are to maintain a tight control over your scouting system, it is unlikely your chief scout will do much. I prefer to use him as a glorified scout (Judging Player Ability + Judging Player Potential), with an added extra of Man Management. Next Opposition: these staff members are obviously irrelevant to the scouting of new players. But they will provide you a report of your opposition several days before the match. This means as well as the JPA+JPP combination, they need Tactical Knowledge too. A familiarity of the league you’re playing in would also be useful, but this will develop over time anyway. Domestic / Foreign: despite the differing locations these two scout sub-groups have the same goal: to identify talented players to buy. Because of this, they need JPA+JPP and ideally a knowledge of the country or region you’re expecting them to scout. If they don’t have that knowledge, then a high Adaptability attribute is vital and Determination can be helpful for scouts covering large areas. The ratio of Domestic / Foreign scouts depends on plenty of factors, but mainly the philosophies you wish to implement, as well as size of the club. Some leagues have strict rules on foreign players, whilst some clubs are simply too small to afford foreign scouting. This is the important bit, because it sets the trend for the type of players you’ll buy. The area you’re wishing to cover should also be kept in mind when signing your scouts; if they already have knowledge of the region you’re sending them to, it’s a massive plus. My scouting department is 10 men large. As my focus is on cheap, foreign signings, I only have one scout domestically. If I were focussing on home-grown talent then that number would increase to two or three. 4. Eastern Europe (22 nations / 6 worth scouting): Czech Republic, Poland, Romania, Russia, Serbia, Ukraine. The other regions I find worth scouting as a whole are; 1. South America, 2. Central Europe, 3. UK & Ireland, 5. North America, 6. North Africa, 7. South Europe, 8. Scandanavia, and 11. Middle East. Any region not mentioned in either of the above two sections is unlikely to provide a constant influx of talented players. I’ve given each region an overall priority, and as my foreign scouting department has eight scouts, I target numbers 1-8. The more scouts you can get, the better. Once the team is above 15, you can either use them to double-up on important regions or to increase your scouting knowledge in other lesser regions. The length of the assignment then depends on the number of countries in that region. As there are 6 countries in Eastern Europe that need to be scouted, my scout Vladan Djurdjevic is given a 2 (12 months divided by 6 nations) month scouting assignment in Czech Republic. Once that has finished he’ll be sent to Poland. Once the board are kind enough to give me more scouts, we have our expansion plan already outlined, with Western Africa and East Asia next on the agenda. Your scouts should now send monthly reports back on their findings. If you set the Potential Ability to be 3* or higher, there won’t be too many rubbish players clogging up the reports. 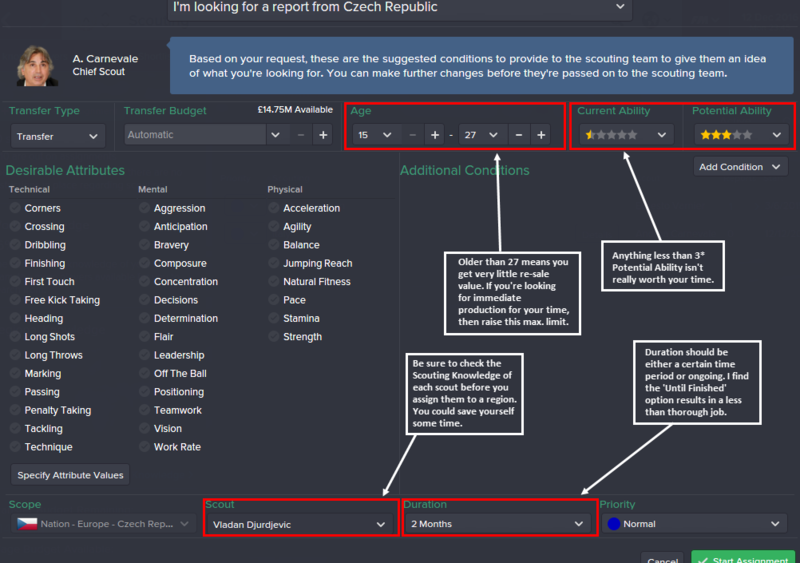 But with the new ‘Fog of War’ feature added into FM15’s scouting, you will need to scout most players more than once to get an accurate reflection of their abilities. I’ll usually only re-scout players who have 2.5* or more of gold stars. However, young players tend to have less gold stars and more black, meaning their potential is more difficult to identify. The process at this point is fairly self-explanatory: you narrow down the player pool to the very best and isolate the value-for-money options. [[http://www.passion4fm.com/football-manager-2015-top-clubs-with-best-youth-facilities/]]HERE[] is another very useful Passion4FM article on clubs with top facilities. It’s often worth looking at the top youth facilities, particularly in countries your scouts aren’t assigned to peruse themselves, and asking for team reports. This can quite easily produce some gems that otherwise slip through the net. If you’ve got any other questions about how I scout in Football Manager, then comment below or @ me on Twitter and I’ll do my best to reply. It’s not a particularly fun area of FM, but once your scouting system is in full-flow, it makes a dramatic difference to the quality of your signings. Great write up mate, enjoyed that. I employ a pretty solid process at Haarlem (my own moneyball style save). I only scout up to 23, again for resale value so that I can train them up then hopefully sell them at their peak value. I set a filter on the scouting view so that I can only see the ones that have “star” recommendation from the scouts and only in the last 90 days. Then, and only then, if a player is on that list and I like him I get a second opinion from another scout. If he is still interesting me then I will send the HOYD to have a look for a couple of weeks. If he is a free agent, I get him in on trial. Then I might sign him! Long winded, but working a treat for me. It’s probably worth adding a bit in explaining how Star Rating works as it can be confusing because if you are a side stacked with talent then a 2 star player will be a great player still. You have to remember the star ratings is pitted against your current players. So if you are a team like Barca for example, then players you find will all have low potential star rating compared to scouting the player at a team like Everton. Very good article. It confirmed it to me, as I work with with scouts for years. In FM15 I’m playing in Scotland and I want to play only with domestic players so I have no scouts outside Great Britain. Only my Chief Scout roaming between european cups. And I agree with “I prefer to use him as a glorified scout” – have same as you in this case. Great article. I really like learning how other people set up their scouting network. I tend to do something similar, but I also try to ensure that I have at least 1 staff member (preferably the scout from that region) from all of the major youth-producing countries (i.e., Argentina, Brazil, Germany, Spain, etc.) to diminish the cloud-of-war scouting effect. I hate it when my scout returns a scouting report and somehow knows that he has 5 star potential (albeit several black stars), but doesn’t have a clue about his current attributes. I also think it’s important to establish feeder clubs in as many nations as possible in order to not only get some of their youth players (I think you only get that when you have the option that specifies that their youth products may come through your academy), but to also ensure a full scouting knowledge of that nation. Anyway, I’m sure you already knew all of that, but it might be helpful for those that look through your comments. In your Udinese save, what leagues did you have selected? In my saves, nations where I haven’t selected a playable league tend to “dry up” over time. No or few new players are generated.